When school gets out, I always breathe a sigh of relief that I’m off the hook for packing lunches for a few months. 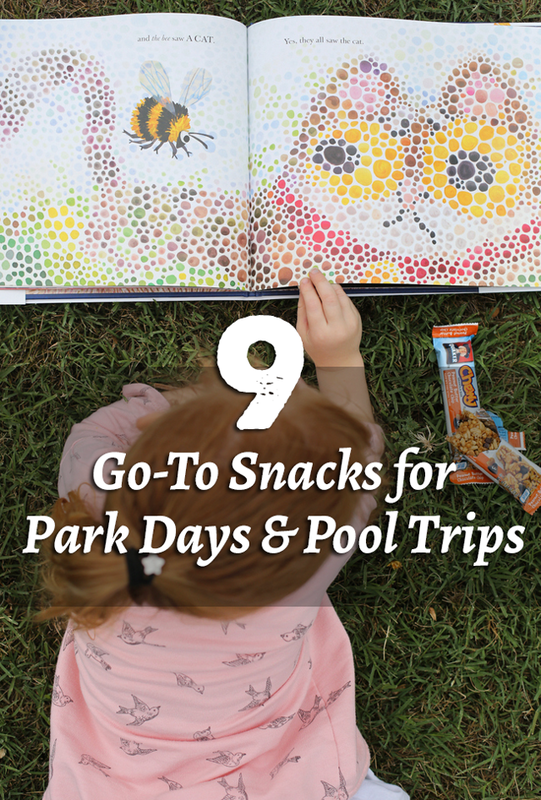 But then, I quickly realize that while the lunch box might be packed away for the summer, we’re still go-go-going whether it’s to the pool, the park, or a family road trip. Like most kids, my little girls are super active, so I’ve put together a list of our family’s favorite grab-and-go snacks that keep everyone happy and energetic all afternoon long. These are a classic and probably the easiest grab and go snack on the planet. I love that I can toss a box in the trunk or a few in my purse and they’re ready when we need them. And I love that they’re a snack I can feel good about. Plus, they are the perfect size for my kids – they can eat the whole thing instead of half of it ending up in the trash can. My children might resist vegetables when there are other options, but when they’re hot and hungry, suddenly they’re devouring carrots and celery like they’re going out of style. Plus, hummus is packed with protein. I like to put hummus in a container then stick the carrots and celery straight in so that my kids can pull them out, already covered in dip. Did you know you can make popcorn with just a brown paper lunch sack and a handful of popcorn kernels? Just pour about 1/4 cup of seeds in the bottom of a lunch sack, fold the top over a few times, then microwave for about 90-120 seconds (like any microwave popcorn, listen for the popping slows). Toss in a little butter and salt, and your snack is ready to go. It’s so inexpensive and totally portable, since it’s already in a bag. My kids get a huge kick out of wrapping strips of string cheese around their hard-boiled egg (we call them “mummy eggs”) and then eating this protein-packed combo. Also, if you’ve never tried baking your hard-boiled eggs in a muffin tin, that trick will change your life! I love that these aren’t sweet but can be made more kid-friendly with the addition of some semi-sweet or dark chocolate chips. A fun way to take your oatmeal to-go. Who doesn’t love this snack? Fill your celery sticks with peanut butter (or cream cheese, if you have nut allergies) and then top with raisins, dried cranberries, or nuts. An extra special treat in our family is topping them with chocolate-covered raisins. This is our family’s go-to. A couple of single-serving yogurt containers get a lot more fun when you bring along a little sack of granola (homemade with Quaker Real Medleys Granola is our favorite). Everyone can choose their own favorite flavors of yogurt and the granola provides a nice contrasting crunch to the smooth yogurt. I love this recipe because it doubles as a project and a snack. We’ll spend one morning making a double or triple batch, then store them in the freezer so we can grab them at a moment’s notice. And the grown-ups love them as a much as the kids! Who doesn’t love guac and chips on a summer day? Try plantain chips as a feel-good snack the kids can chow down on all afternoon. What keeps your family fueled during the summer months? This post was written as part of our participation in The Oat Authority, a team of top bloggers out to help Quaker meet the needs of families’ evolving lifestyles with tips and recipes that inspire delicious, wholesome and convenient breakfasts and snacks! 4 Oatmeal Recipes that Will be Ready When You Wake Up!